"However the effect of downwelling infrared is always to use up all the infrared in increasing the temperature of the ocean surface molecules whilst leaving nothing in reserve to provide the extra energy required (the latent heat of evaporation) when the change of state occurs from water to vapour. That extra energy requirement is taken from the medium (water or air) in which it is most readily available. If the water is warmer then most will come from the water. If the air is warmer then most will come from the air. However over the Earth as a whole the water is nearly always warmer than the air (due to solar input) so inevitably the average global energy flow is from oceans to air via that latent heat of evaporation in the air and the energy needed is taken from the water. This leads to a thin (1mm deep) layer of cooler water over the oceans worldwide and below the evaporative region that is some 0.3C cooler than the ocean bulk below." The recent paper by Roy Clark, PhD also discusses the physics and concludes, "Application of Beer’s law to the propagation of solar and LWIR [long-wave infrared] flux through the ocean clearly shows that only the solar radiation can penetrate below the ocean surface and heat subsurface ocean layers. It is impossible for a 1.7 W.m−2 increase [predicted by the IPCC due to man-made greenhouse gases] in downward ‘clear sky’ atmospheric LWIR flux to heat the oceans." (p. 196). Increasing levels of IR-active 'greenhouse gases' would instead be expected to cause increased evaporative surface cooling of the oceans. N.B. there is also a negative feedback phenomenon on CO2 levels discussed in a paper published in Nature which shows that the evaporative cooling of the ocean 'skin' from increased downwelling IR allows increased uptake of CO2 due to increased solubility of CO2 at lower temperatures. The huge mass and heat capacity of the oceans regulates and stabilizes global temperatures to a far greater degree than any possible influence from mankind. For a thought experiment, assume all 89 PW are taken up by the oceans and that the oceans don't release any of that heat. That would add 0.67 yotta calories to the 1.3 yotta grams, resulting in an increase in the ocean temperature of only 0.5C after an entire year. Now, let's also assume that the IPCC is correct that 'greenhouse gases' are causing 1.7 W/m2 'radiative forcing,' and that it is possible for this IR 'back-radiation' to penetrate and heat the ocean (even though we've already shown that is impossible above). The 1.7 W/m2 works out to 850 Tera watts (TW) [or .85 PW] when multiplied by the total Earth surface area of 500 tera square meters. Thus, the IPCC claims that 'greenhouse gases' are preventing .85 PW of energy from leaving the atmosphere to space. This .85 PW is less than the 89 PW from the Sun by a factor of 105 times. Plugging this into our thought experiment above shows that the change in ocean temperature from 'greenhouse forcing' would be 0.5C/105 or .005C in one year or only 0.5C after 105 years, assuming the oceans release none of this added heat! In reality, of course, the oceans would release all or most of this added heat by convection, evaporation, or radiation, leaving at most only a few hundredths of a degree temperature change after 105 years. Thus, it is impossible for 'greenhouse forcing' to raise ocean heat content to any measurable degree, or cause melting of the icecaps from below, or increase sea levels from thermal expansion. 3. The Second Law of Thermodynamics requires heat to flow one-way from hot to cold. Since the atmosphere is colder (average radiating temperature of ~ -10 C) than the ocean surface (~ 17 C), the 2nd Law of Thermodynamics states that heat can only be transferred one-way from the ocean surface to the atmosphere, not the other way around. 1. The latest Chilingar et al paper also discusses heat capacity of the atmosphere, which should decrease due to added CO2: "saturation of the atmosphere with carbon dioxide, with all other conditions being equal, results not in an increase but in a decrease of the greenhouse effect and average temperature within the entire layer of planet’s troposphere. This happens despite intense absorption of the heat of radiation by CO2. The physical explanation of this phenomenon is clear: molecular weight of carbon dioxide is 1.5 times higher and its heat-absorbing capacity is 1.2 times lower than those of the Earth’s air. As a result, the adiabatic exponent for a carbon dioxide atmosphere, at the same all other conditions, is about 1.34 times lower than that for a nitrogen–oxygen humid air"
4. NOAA says the oceans are the drivers of global temperature, not the land surface. 5. Dr. Pielke asks whether James Hansen's GISS model should be rejected as unskillful. Great post! The extreme emphasis by so many scientists on radiation and the greenhouse effect is silly. I am horrified at the idea that anyone would consider this an accurate assessment of the Earth's current state. Do you realise how ridiculous it is to take a 12 year sample of weather patterns that have been in existence for more than 2 billion years. Should you have been educated in the field and knew your statistics you too would realise this. To put it in perspective (since the numbers are roughly similar) what you are suggesting is as ridiculous as it would be to make a full analysis of the human population having just met two randomly selected people. Your data is statistically insignificant and you cannot, therefore, draw the conclusions you have from the data. Not to mention points 2 & 3 which take no account what so every for any of the other hundreds of processes that are involved. For example, in point 2 you say that "the Infrared radiation from 'greenhouse gases' causes evaporative cooling of the oceans rather than heating", but the fact that you have not even considered where this energy (heat) has gone i find alarming. The worst thing is that there are people who will read this as fact, and to those of you i urge you to read just some of the evidence that phenomenal amounts of research has produced and form your own opinion; i am convinced you will be able to discard this article as a piece of ill educated & highly bias drivel. Your comment makes no sense. What data specifically do you claim to be insignificant? If you don't think it is worthwhile to look at the satellite data and ARGO data, both of which show cooling instead of the AGW-model-predicted heating since 1998 then I guess you should stick your head in the sand until you think enough time has elapsed to illustrate the serious shortcomings of the AGW models and predictions. You just don't understand the science in point #2 & #3, so best you re-read it and read the paper by Roy Clark and post by Wilde which prove the same. When LWIR hits the surface of the oceans the heat goes into changing the state of water from liquid to vapor and there is no additional heat left over to heat the oceans. Read Wilde's thorough explanation. has anyone ever seen an experiment that compared the warming capacity of LWIR verses SWUV? I know an experiment cannot exactly reflect real world conditions, but it appears logical that it can put the physics on paper to a real world experiment and somewhat isolate the various spectrum and their different warming affect on H2o. I am also very intrested in the residence time of various TSI in all spectrum once it reaches the ocean, as this must be critical in determing net warming of the ocean over time verses short term atmosphere changes. Atmosphere warming can still mean global cooling is taking place. Completely agree with everything (great article) except for the 2nd law of Thrmodynamics bit: "heat can only be transferred one-way from the ocean surface to the atmosphere". This applies to a solid object, heat can only flow from hot to cold. However when you have two objects emitting radiation (in this case Air and Earth) then both can receive and transmit energy. However the hotter body transmits more than the cooler body, so there is a net cooling of the hotter body and a net warming of the cooler body. So let's rewrite the statement to: "NET heat or energy can only flow from the ocean surface to the atmosphere". The tropics drives global energy levels, so my personal opinion is that the humid tropical air is already absorbing and transmitting all IRR in the finger frequency that CO2 can, so a tripling of CO2 shouldn't make much if any difference. QED: (Net) heat can only flow from the warmer to the colder object. If you are concerned about transfer of heat from atmosphere to ocean,get yourself an electrical heat gun and hold it over a bucket of water for 5 minutes. No heat transfer. reason, surface tension. NO heat transfer period. Anonymous is right, you cannot heat water from above on this planet due to surface tension. Science has made a huge mistake in assuming that the ocean surface will obey the second law of thermodynamics. science assumes that the second law of thermodynamics is universal but it hasn't checked, surface tension changes everything. The ocean only accepts radiation not physical heat. That is probably why we still have oceans. 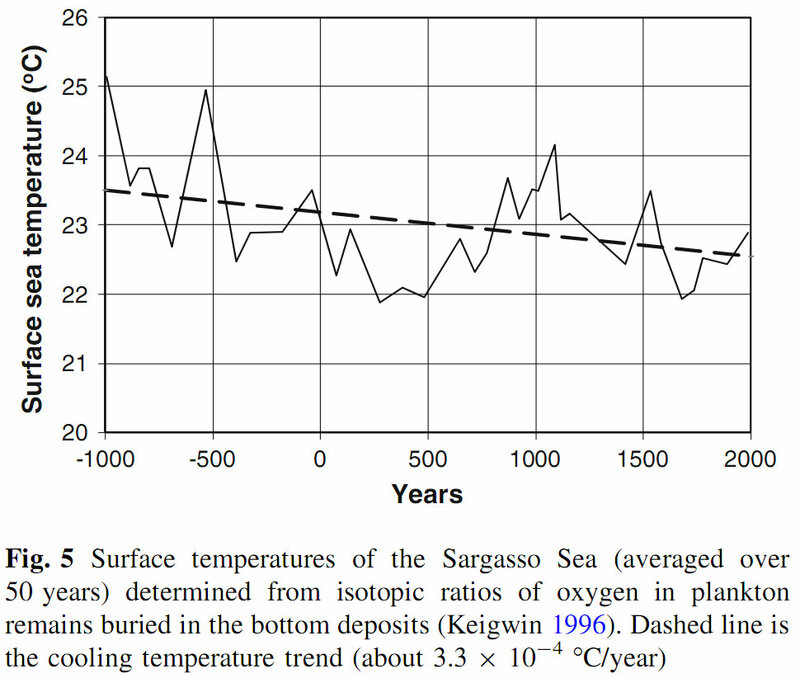 The only paper they could find shows the relationship between sea surface temp and LW forcing is 0.002ºK (W/m2)-1. In other words, a doubling of CO2 concentrations [alleged to cause 3.7 Wm-2 forcing] would increase sea surface temperatures by .0074 degrees - essentially zero. You must be kidding. RealClimate.org is assumed by those who do not know any better to be an "objective" source on climate change. It features activist scientists with degrees in Geology, Geosciences, Mathematics, Oceanography and Physics who are all self proclaimed "climatologists". Yet skeptical scientists with equivalent credentials are not (probably because they have not proclaimed it). Essentially the site exists to promote global warming alarm-ism and attack anyone who does not agree with their declaration of doomsday (proven of course by their own computer climate models) and the need for government intervention against the life supporting, atmospheric trace gas, carbon dioxide. It is well known that in the perpendicular plane, water is a very good absorber of LWIR and does not reflect LWIR. As no doubt most people know 50% of all LWIR is absorbed by water within just a few microns. However, is this angular dependant? Does anyone know whether at low incidence, say 10 degrees or less to the horizontal plane, whether water reflects some proportion of LWIR interfacing with water at that low incidence angle? I would be interested to receive feedback and particularly to any research on the subject. OH NO! not that again. This is a very informative article but there you blow it completely. As you state, 2nd law tells us about HEAT transfer , hence "thermo"+ dynamic . IR is radiation, NOT heat. There is no law that says EM radiation cannot go from a cold to a hot body. Neither is there a law which says no form of energy can go from cold to hot. If that was the case we would not be able to observe the background radiation from space with a temperature of only 3 kelvin !! I'm very well aware IR is radiation and not HEAT and does travel from cold to hot bodies. However, it is not thermalized in the hot body i.e. it does not convert to HEAT. Lower-frequency lower-energy radiation from a cold body cannot make a hot body hotter. The reason is that all of those lower-frequency lower-energy quantum states are already filled in the hot body. This is referred to as frequency cutoff for thermalization. That is why there is a two-way transfer of radiation, but only a one-way transfer of HEAT. This is the basis of the 2nd law as stated above. Most down welling LWR is in the tropics. The tropics over sea has very moist air. Water vapour absorbs and radiates most of the LWR so adding large amounts of CO2 makes very little difference? Next point, CO2 can only absorb LWR at around 15 micro metres wavelength. That only occurs at temperature of around -50C which only occurs at the poles near the ground or very high up at lower latitudes. Therefore very, very little chance of LWR heating the oceans anywhere near you! If LWR doesn't heat the oceans (and, I'm not claiming it does), then what does heat the oceans? SWR? The Heat (or Enthalpy) of Vaporization is the quantity of heat that must be absorbed if a certain quantity of liquid is vaporized at a constant temperature. In a solution with both a vaporized and liquidized states, the kinetic energy of the vapor is higher than the kinetic energy of the liquid. Temperature follows kinetic energy, showing a lower temperature in the remaining liquid. "[T]he temperature of the water throughout the top 2 m of depth is constant due strong mixing, and the skin is significantly colder due to strong evaporative cooling. During the nighttime hours of 16 January, after a period of relatively weak wind, there is a progressive increase of temperature with depth due to evaporative cooling, with this temperature gradient diminishing during the daytime hours (after 1200 UTC) due to heating by absorbed sunlight." "The cool skin represents a few tenths of a kelvin cooling by radiative and turbulent fluxes in the upper millimeter of the ocean; the warm layer may be several kelvin of solar-induced warming in the upper meter." "Skin SST is typically 0.1 -0.5 K cooler than the immediate sub-surface water, although considerable variation in the skin-bulk difference has been observed (e.g. Donlon et al., 1999). This temperature difference is due to the vertical heat flux through the thermal boundary layer in the top millimeter of the ocean; net surface heat flux is almost always from ocean to atmosphere, resulting in a cool ocean skin. Total heat flux at the surface is the sum of the net infrared, sensible and latent heat flux, and in daytime a contribution from the small proportion of incoming solar radiation absorbed in the skin layer. Heat transfer through the boundary layer is predominantly due to molecular conduction, as turbulent transfer is suppressed by the density difference across the ocean-air interface." "On a clear day the Sun deposits an average of about 500 W/m-2 of heat into the ocean over the 12 daylight hours. Roughly half of this heat is absorbed in the upper 2 m. In the absence of mixing this is sufficient heat input to warm this 2-m-deep layer uniformly by 2.0 K. ... Measurable warming occurs as deep as 20 m and may persist well past sundown." "Evaporation as well as back radiation contributes to a cooling of the surface of 0.1 to 0.2 centigrade under neutral conditions, while under diabatic conditions greater surface temperature deviations are caused by heat exchange." "While short-wave radiation will warm both surface and subsurface layers, long-wave radiation will cause a cooling of the surface depending on the temperature and humidity of the air. The exchange of sensible heat will tend to cool or warm the surface dependent on the air being cooler or warmer than the water. Evaporation in most cases will cause a cooling of the surface. In general, the effects of radiation, evaporation, and heat transfer will be indistinguishable." "...[D]aytime skin effect was strongly influenced by direct solar illumination and typically had a mean of 0.5 K in the morning that decreased to 0.1 K by midday..... [D]aytime solar heating stratifies the temperature profile of the surface. With this in mind the negative skin effect results from two separate processes: (1) intense daytime solar heating overcomes the net upward longwave energy flux and warms the skin, or (2) the right combination of low wind and solar heating creates a warm layer of water above the floating thermistor." "Located at the upper limit of the molecular boundary layer, the skin temperature is generally a few tenths of a degree cooler than the temperature a few millimeters below it because of heat loss by sensible and latent heat fluxes as well as outgoing longwave radiative fluxes (Robinson et al. 1984)." "The near-surface temperature gradients that introduce a difference in the skin and bulk temperatures result from three distinct processes: the absorption of insolation, the heat exchange with the atmosphere, and levels of subsurface turbulent mixing. In conditions of low wind speed, the heat generated in the upper few meters of the water column by the absorption of solar radiation is not mixed through the surface layer, but causes thermal stratification and temperature differences between the uppermost layer of the ocean and the water below. There is a strong diurnal [sunshine] component to the magnitude of these temperature gradients, as well as a dependence on cloudcover, which modulates the insolation, and wind speed, which influences the turbulent mixing. The surface skin layer of the ocean, much less than 1 mm thick, is nearly always cooler than the underlying water because the heat flux is nearly always from the ocean to the atmosphere. The heat flow supplying energy for both the turbulent and radiant heat loss to the atmosphere is accomplished by molecular conduction through the aqueous side of the interface and this gives rise to and is controlled by a temperature gradient in the surface skin layer." "Radiant heating is the largest term in the heat budget for the WWP [Pacific warm water pool] and is unique in that it acts beyond boundaries. In situ irradiance data recorded during TOGA COARE indicate that between 60% and 90% of the solar energy reaching the sea surface is attenuated within the top 10 m of the ocean (Ohlmann et al. 1998). Such a discrepancy in solar transmission can result in a radiant heating rate difference of more than 0.12 C /day for the 10-m layer (based on a climatological surface irradiance of 200 W/m-2). Variations in the transmission of solar radiation can also influence the upper ocean heat budget indirectly, through water column stability (Ohlmann et al. 1996; Schneider et al. 1996; Ohlmann et al. 1998). The study by Schneider et al. (1996) states ‘‘mixing due to penetrative radiation is a central mixing mechanism for the western Pacific warm pool.’’ Thus, both the quantity of incident solar irradiance and the manner in which the irradiance is absorbed within the water column must be known to successfully model upper ocean thermal evolution." "The heat balance of the global ocean surface layer is calculated using bulk flux formulations. Maps of the long-term monthly and annual means of the net surface energy flux together with the four components of the total flux (latent heat flux, sensible heat flux, incoming radiation, and outgoing radiation) for the global oceans are presented. Incoming solar radiation and latent heat flux are the two dominant components that control net surface energy fluxes. Wind speed, cloud cover, and the gradient of specific humidity are the three most important meteorological parameters in determining surface flux." "The size of the observed net cloud forcing is about four times as large as the expected value of radiative forcing from a doubling of CO2. The shortwave and longwave components of cloud forcing are about ten times as large as those for a CO2 doubling. Hence, small changes in the cloud-radiative forcing fields can play a significant role as a climate feedback mechanism." "Ship observations and ocean models indicate that heat export from the mixed layer of the western Pacific warm pool is small (<20 watts per square meter). This value was used to deduce the effect of clouds on the net solar radiation at the sea surface. The inferred magnitude of this shortwave cloud forcing was large (≈ – 100 watts per square meter) and exceeded its observed value at the top of the atmosphere by a factor of about 1.5. This result implies that clouds (at least over the warm pool) reduce net solar radiation at the sea surface not only by reflecting a significant amount back to space, but also by trapping a large amount in the cloudy atmosphere, an inference that is at variance with most model results. The excess cloud absorption, if confirmed, has many climatic implications, including a significant reduction in the required tropics to extrattropics heat transport in the oceans." "Global satellite observations show the sea surface temperature (SST) increasing since the 1970s in all ocean basins, while the net air–sea heat flux Q decreases. Over the period 1984–2006 the global changes are 0.28°C in SST and −9.1 W m−2 in Q, giving an effective air–sea coupling coefficient of −32 W m−2 °C−1 …[D]iminished ocean cooling due to vertical ocean processes played an important role in sustaining the observed positive trend in global SST from 1984 through 2006, despite the decrease in global surface heat flux. A similar situation is found in the individual basins, though magnitudes differ. A conclusion is that natural variability, rather than long-term climate change, dominates the SST and heat flux changes." "Water vapour and cloud are the dominant regulators of the radiative heating of the planet. ... 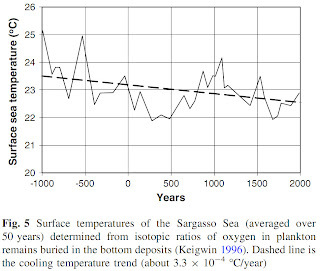 It would take more than an order-of-magnitude increase in atmospheric CO2 to increase the maximum [sea surface temperature] by a few degrees"
Is the 'Greenhouse Effect' based on a 'cool' Sun?